FOR MOST people, spending thousands of pesos and traveling halfway round the world evokes images of a relaxing vacation—not that of waking up early in the morning to wait in line in the cold mist for five hours just to get the chance to run 42 kilometers for four or five more hours. But then again, Doctors Yong Larrazabal and Peter Mancao are not most people. 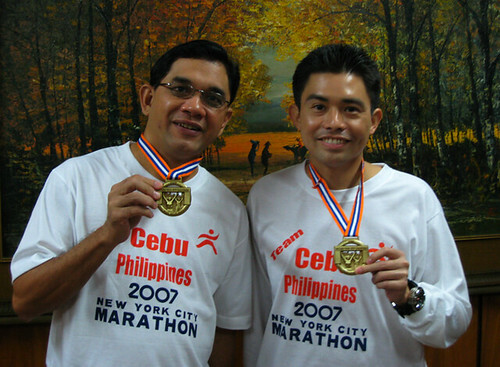 The two recently joined more than 39,000 runners in the 37th staging of the New York Marathon, finishing 5:35:47 (Mancao) and 4:39:53 (Larrazabal). 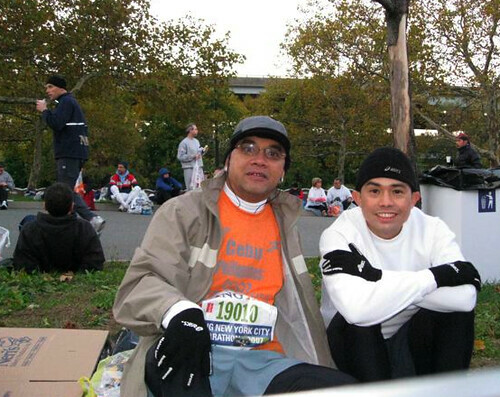 “It’s like the whole city stopped for the marathon,” said Larrazabal. For Mancao, it was a chance to finally run a full marathon after months of practicing, while for Larrazabal, it also served as a homecoming, while getting his competitive spirit stoked under difficult circumstances. 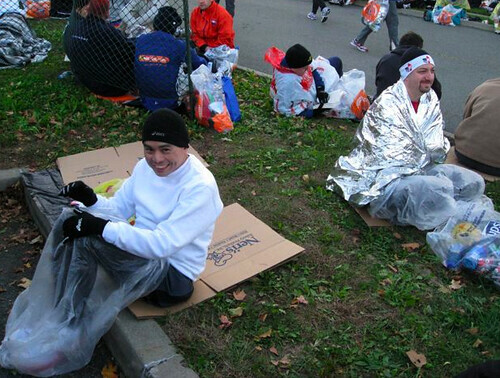 “When we got to the starting line, we had to ask for cartons and plastics to cover ourselves from the cold,” said Mancao. After waiting for more than five hours, they finally heard the starting pistol and had to wait for more than 30 minutes just to get to the starting line. 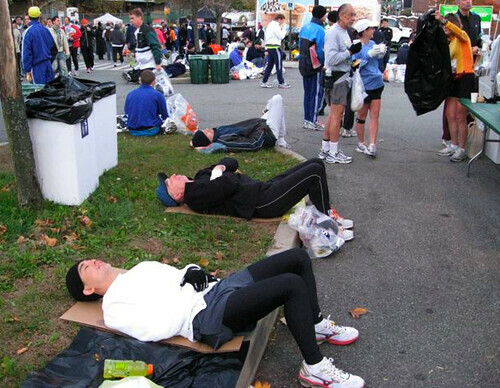 “There were so many people, after the marathon, if you want to search for your relatives. They were assigned places in alphabetical order,” said Larrazabal. The two were together for the early part before the younger doctor sped away. “I had to lock my arm around his and I told him we were going too fast,” said Mancao, who promised Yong’s wife, Donna, to keep his pace manageable. “Gipa konsensya ko,” Larrazabal said. But after the two broke apart, it was each man to himself, and they had different “motivators” that helped them through. Though they got cheered by the crowd for most of the run, seeing a guy with a shirt that says in the back “I’m 75 and I’m still running,” fueled Mancao’s fire enough to overtake that man. Katie Holmes’ back. “I also saw a group of blind runners, and I told myself. I have to overtake them,” said Mancao, who also said he saw the back of Katie Holmes and at one point was also chasing a lady runner in a two piece. For Larrazabal, who was the fourth-best Pinoy finisher but the second best in the 20K mark, it was something else. In the 28K mark, while his feet was struggling, a guy in a Sponge Bob costume overtook him, and then later, the 4-hour pacesetters, the 4:15 group and finally, just near the end, the 4:45 group passed by him. The runners can select a pace setter and if they follow that, they will finish the run in that designated time. “When the 4:45 group passed me, I said, ‘di na ni pwede’ so I picked up my pace,” said Larrazabal. After joining one of the world’s biggest marathon, the two are setting identical targets and separate goals. They want to join either the Boston Marathon or Hong Kong Marathon next year, while Mancao aims to go to New York again but this time wants his whole family to run with him. how i wished i could run like the two doctors. the stamina they displayed was worth emulating considering they are active practioners but find time to perfect that “run” of their lives. salamat sana mabasa mo ito.sana mkatanggap po ako ng letter galing sa inyo. gud luck po…. jyane_21@yahoo.com yan po add ko. Hello po Ate Donna pariho po pala kami ni jyane idol na idol din kita naiiyak ako kapag napapanood kita sa Tv dahil hinahangad ko po na sana makita kita sa personal. And ganda kasi nag ugali at ang mukha ninyo simple pero maganda. Sana po makita kita sa isang lugar na hindi inaasahan. I hope you can read this message and give me a chance to see u in person this is my email if ever you want to contact me. florabelle_saint@yahoo.com. Dito po pala ako sa Urgello ngayon nakatire. Salamat Po. At saka balak ko sanang pumunta sa Cebu Doc. para magtatanung about you pero dinaig ako sa hiya. Minsan nagpadala ako ng letter sa friend ko na si Miscell Guibuena isang mahusay na Runner also at nagkataon na tatakbo daw po kau ng 5k lang sa Ayala po yon kaya nagpadala ako ng sulat, at inaasahan ko po na tatawagan ninyo ako para magkakita po tayo pero nabigo ako. OK lang baka Busy lang kau. Sana sa pagkakataong ito matutupad na po ang hiniling ko.Salamat Po.